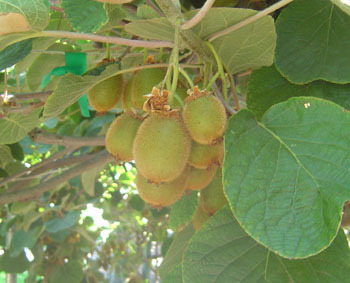 The kiwifruit is borne on a vigorous, woody, twining vine or climbing shrub reaching 9 m. Its alternate, long-petioled, deciduous leaves are oval to nearly circular, cordate at the base 7-12 cm long. Young leaves and shoots are coated with red hairs; mature leaves are dark-green and hairless on the upper surface. The fragrant, dioecious or bisexual flowers, borne singly or in 3's in the leaf axils, are 5- to 6-petalled, white at first, changing to buff-yellow and both sexes have central tufts of many stamens though those of the female flowers bear no viable pollen. The oval or ovoid fruit, up to 6 cm long, with brown skin densely covered with short, stiff brown hairs, is capped at the base with a prominent, 5-pointed calyx. The flesh, firm until fully ripe, is glistening, juicy and luscious, bright-green succulent center from which radiate many fine, pale lines. 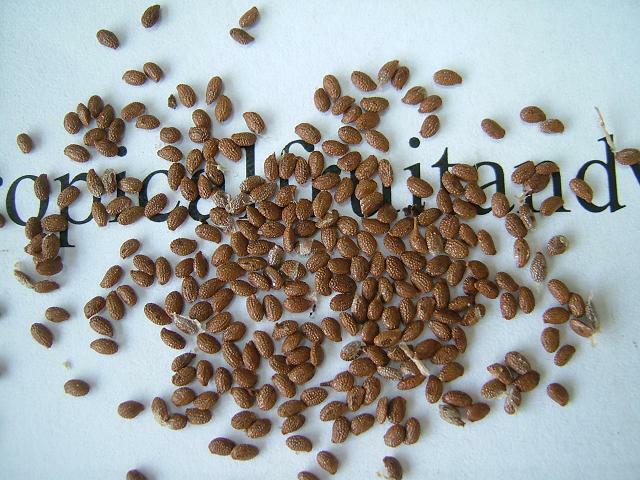 Between these lines are scattered minute dark-purple or nearly black seeds, unnoticeable in eating. The kiwifruit vine grows naturally at altitudes between 600-2,000 m with heavy rainfall and an abundance of snow and ice in the winter. 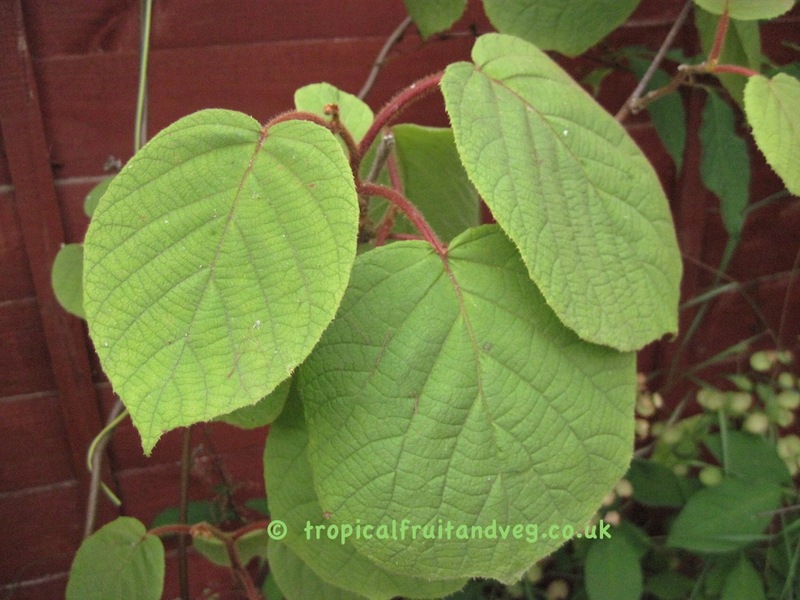 Kiwifruit vines in leaf are killed by drops in temperature below -2� C, while dormant mature vines can survive temperatures down to -12� C.
For good growth, the vine needs deep, fertile, moist but well-drained soil, preferably a friable, sandy loam. Heavy soils subject to water logging are completely unsuitable. From seed, grafting and softwood cuttings.